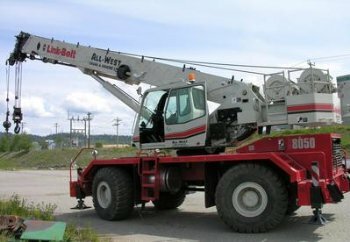 When you need crane and rigging equipment for your construction project our team at All-West Crane and Rigging Ltd. is here to provide you with the right equipment. Our team has assembled equipment to specifically address your needs on the job site so you can have a safe and effective project. We have the ability to even help you transport your equipment from one place to another so you can get to work quickly. Rental cranes: We are very proud to have a wide range of cranes available – fully operated and maintained – for a full service package. This allows us to be able to better meet your needs so you and your team can get to work, while we take care of the heavy lifting. Support equipment: When you need additional construction support equipment, we are able to help you obtain the bobcat, forklift, or trailer you need to get the job done. Transport fleet: Our team has acquired many transportation vehicles to effectively carry vehicles and equipment to the site so you can have the necessary equipment available whenever and wherever it is needed. Cranes for sale: Throughout our time in the industry, we have acquired high-quality cranes and equipment, and when we replace these cranes with newer models, we are able to offer some of these cranes for sale. Check out our Cranes for Sale page from time to time to see what is available. All-West Crane has proven to provide quality service to our project needs. Recent jobs required multiple cranes, specialized operators and a skilled service team willing to work on our own equipment. All-West Crane has always been safe, reliable and affordable. The 3D lift planning and modelling services brings potential cost savings along with added safety and confidence. We look forward to working with All-West Crane on our upcoming projects! Our accomplished team at All-West Crane and Rigging Ltd. has the knowledge, resources, and experience to provide your team with the right equipment. With more than 20 years of experience in the mining and steel industries, we understand what it takes to keep your team safe while on the job. That commitment to safety helped us acquire B CCSA’s Certificate of Recognition for Health and Safety Management System. Call us today at (250) 992-5592 or (780) 231-2910 to learn more about our cranes and how we can make your job easier.